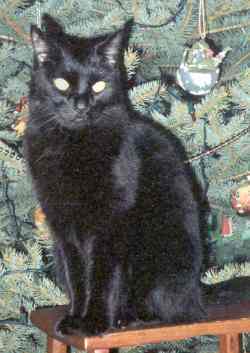 Rolex was adopted as a kitten in 1990 by George and Harriet, who say that he considers himself "King of the Hill". In this photo, Rolex shows that he likes to help in "any way he can." 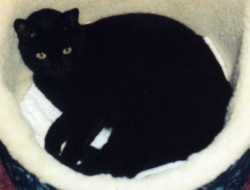 Monty was an FIV-positive cat who was adopted by Heidi in 1996. She wrote to tell us that Monty passed away in April 2003 of a blood clot, saying, "we are glad he had a good and pampered life in the end and he is greatly missed." 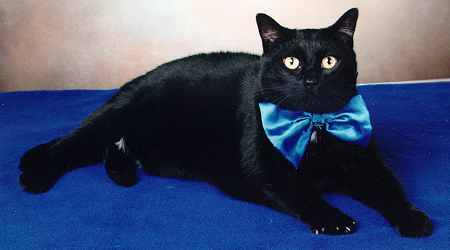 Java was adopted in 1995 by Joan and Steve, who say that he is now "eight big pounds and we all love him." 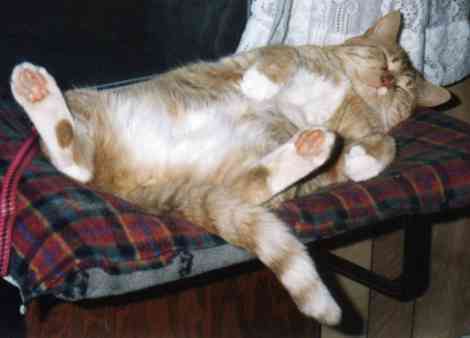 Kostas was about two years old when he was adopted by Deb in 1990, and fit right in immediately with the other cats. He has a sweet disposition and a real baritone purr. He is a world class wild life watcher; big birds, little birds, squirrels, skunks, you name it, he watches it. He also enjoys eating, and really likes vegtables of any kind. In fact, during the summer months, he won't touch his supper unless he has a little "salad" (a slice of tomato and a few beans) on the side.